Budapest, Hungary, 2015-7-2 — /Travel PR News/ — A live concert, a contemporary art exhibition and hundreds of guests celebrated the grand opening of Budapest’s newest restaurant, the KOLLÁZS Brasserie & Bar. Located in Four Seasons Hotel Gresham Palace Budapest, next to the Danube’s iconic Chain Bridge, KOLLÁZS unites the contrasting atmospheres of the bustling metropolitan Pest and the verdant hills of bourgeois Buda. Vibrant and inspiring, yet casual and affordable, KOLLÁZS Brasserie & Bar is a contemporary European brasserie in a landmark Budapest location. Named for the Hungarian word for “collage,” KOLLÁZS places focus on creative combinations in all aspects of the dining experience. The interior design reflects the artistic era of the 1910s and ’20s, honouring Art Nouveau and Budapest’s legendary coffee house culture. Conceived by EDG Design of San Francisco, the look is a collage of the old and new, the luxurious and simple, in keeping with the character of Budapest. Bringing together four distinct focal points – the rotisserie, bar, wine cellar and patisserie – as well as a convertible, all-season terrace, the environment is at once hip and relaxed, whether for breakfast, lunch or dinner. The contractor was Market Építő Zrt. As a counterpoint to the historic interior, the displayed artwork is contemporary, featuring regularly changing exhibitions curated by Art Market Budapest, the organiser of Eastern Europe’s top international contemporary art fair. Chef Árpád Győrffy – previously chef at Arany Kaviár and sous-chef at Alabárdos in Budapest – has created amenu that blends local and international flavours, as well as traditional and modern dishes. The focus is on modern European and French brasserie cuisine with signature Hungarian specialties. Cocktails are traditional with a chic, modern twist, based on a bar menu created by Jaime Jones, the London-based international bar consultant and global gin connoisseur. The localised recipes – and names such as the Zwackapa – are brought to life with authentic Hungarian ingredients such as Unicum herbal liqueur. The bar also gets a helping hand from the kitchen with state-of-the art culinary technologies, such as sous vide, also featuring on the cocktail list. This blend of local ingredients, classic recipes and inventive techniques creates a unique, yet harmonic collage in the glass. KOLLÁZS’s sommelier Mátyás Szik has won the Hungarian Sommelier Championship twice – in 2013 and 2014 – and was previously head sommelier at Budapest’s Prime Steak & Wine. The music at KOLLÁZS blends well-known songs, such as Hungarian and French tracks from the 1950s and ’60s, with modern sounds to produce an exclusive soundtrack for the restaurant. Headed by restaurant manager Mihály Kártyás, the KOLLÁZS team provides service that is casual, friendly and social. As part of the plan to create a lively atmosphere, the restaurant offers reasonable prices that are intended to attract an eclectic mix of people. KOLLÁZS – the Hungarian word for “collage” – is the most dynamic form of art, combining myriad elements such as paint, photography, sketches and pieces of newspaper. A collage brings together whatever the artist decides to incorporate – anything is possible. 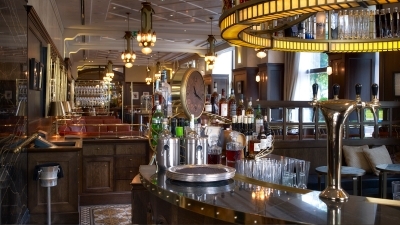 The name comes to life at KOLLÁZS Brasserie & Bar in the combination of classical design and contemporary art, as well as traditional and modern cuisine. KOLLÁZS embodies the exciting, multi-faceted nature of today’s dining scene. Chef Árpád Győrffy creates a collage of European, French and Hungarian dishes, prepared both in the kitchen and in the restaurant’s open rotisserie area. With its location within Budapest’s historic Gresham Palace, KOLLÁZS Brasserie & Bar has a legacy of artistic tradition, now revived in the form of a contemporary art program. Nearly 100 years ago, Gresham Palace hosted the legendary Gresham Circle’s meetings, a gathering place for key figures on the Hungarian art scene, including renowned painters as Aurél Bernáth, Pál Pátzay, Róbert Berény and István Szőnyi. They enjoyed the lively café environment and the creative atmosphere, as well as the excellent food and drink. To continue this artistic heritage, KOLLÁZS has joined forces with Art Market Budapest, the organiser of Eastern Europe’s top international contemporary art fair, to create an on going art program that revives the artistic spirit of the Gresham Circle. Temporary exhibitions showcase site-specific collections of art, with new selections three times per year. Kollázs restores the lively, creative atmosphere of the Gresham Circle era, combining it with the excitement of today’s international art world. The opening art show at KOLLÁZS displays modern works of collage, building on a great artistic tradition. Such high-ranking masters of international art as Georges Braque and Pablo Picasso applied the technique of collage more than 100 years ago, followed by acclaimed Hungarian artists of the 1920s and ’30s, including Lajos Kassák, Endre Bálint and György Kepes. The popularity of the collage technique stretches through artistic generations. Local artists – acting here like chefs de cuisine, using almost anything available in the kitchen – bring together the widest range of materials, restricted only by their imaginations. Márta Balla (Born: 1980, Cegléd, Hungary) A visual artist, graduated from Spain’s Polytechnic University of Valencia, Balla currently lives and works in Budapest. Her art combines elements derived from nature and the urban environment. Szilvia Fekete (Born: 1987, Budapest, Hungary) A painter currently living and working in Budapest, Fekete completed her studies in 2013 at the Hungarian University of Fine Arts. In her current collage series, she mostly focuses on the transfiguration of the human body. Ron Fischer (Born: 1990, Beer-Sheva, Israel) Currently living and working in Budapest while studying at the Hungarian University of Fine Arts, Fischer’s works are open discussions on everyday human behaviours. Gábor Kerekes (Born: 1975, Budapest, Hungary) After studying as a painter, Kerekes builds mostly large site-specific installations in public spaces. He recently turned his attention to experimental collages. Éva Köves (Born: 1965, Moscow, Soviet Union/Russia) A painter who graduated from the Hungarian University of Fine Arts in 1988, Köves is currently based in Budapest. In her work, she often applies her own photos onto the canvas and further paints the composition, blurring the edges. Júlia Végh (Born: 1990, Budapest, Hungary) A young painter presently completing her master’s degree at the Hungarian University of Fine Arts, Végh recently won the prestigious Essl Art Award. Her art is focused around current social issues and questions related to the flow of life. Art Market Budapest is Eastern Europe’s leading international contemporary art fair. Established in 2011, the annual show features established exhibitors, alongside a younger generation of galleries and artists, including the emerging stars of the future. With approximately 100 exhibitors from nearly 30 countries and an audience of more than 25,000 international visitors, the art fair clearly indicates that Budapest has secured its position as a new artistic platform, bringing a fresh new force to the European and global art scene. The next show takes place from October 8 to 11, 2015, at Millenáris, Budapest. Selected to manage the art program at KOLLÁZS, Art Market Budapest features a highly experienced, dynamic and creative team. Members of the team are available to offer consulting services throughout the year. Design Aesthetic: The design reflects Budapest’s artistic era of the 1910s and ’20s, encapsulating Art Nouveau style and coffee house culture, and highlighting a rotating selection of contemporary art, in collaboration with Art Market Budapest. This entry was posted in Food & Drinks, Hospitality, Hotels, Luxury, Travel Management, Travel Services, Travelers and tagged Four Seasons Hotel Gresham Palace Budapest, KOLLÁZS Brasserie & Bar. Bookmark the permalink.